The Palace Cinema, Clifton Street, Lytham. 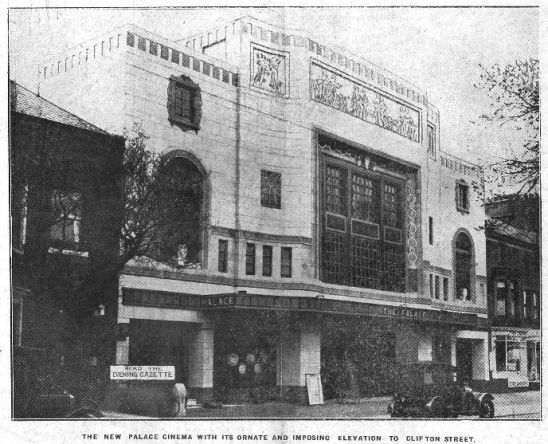 The Palace Cinema, Clifton Street, Lytham opened in 1930. EASTER MONDAY of 1930 in Lytham will be a day very different from any other Easter Monday since the town "came on to the map " many centuries ago. It is a day that will mark a new era in the social life of the town; the day which will witness the introduction of that virile private enterprise of which past generations have dreamed as being necessary for the advancement of Lytham as a residential and, particularly, as a visiting resort. The Blackpool Tower Co., Ltd., famed far beyond the shores England for their supreme entertainments for the million, have taken Lytham under their wing and built a cinema which embodies on its technical side everything of the last minute up-to-dateness for the perfect exhibition of pictures; whilst in its accommodation and furnishing it is the last word, in luxurious and artistic comfort. The Lytham people will speak with pride of their cinema—named the Palace—which has been described as one of the choicest in England, having accommodation for 1,300 people. They have watched it in building, and on Monday they will see its doors thrown open for the first exhibition. Truly, Monday will be a great day in the history of the town. The opening ceremony will .be at 2-15 p.m. by Mrs. Clifton, who will be supported by the Mayor (Coun. A J. Price) and the Mayoress (Mrs. J. Blackledge), Aldermen and Councillors, members of the HospitaI Committee, and members 'of the Board of Directors of the Tower Co.
After Mrs. Clifton has declared the cinema open, the Mayor will speak on behalf of the Borough of Lytham St. Annes, and Capt. W. E. Nuttall, chairman of the Lytham Hospital, will express the thanks of the committee to the Tower Company for ' their generous gift of the afternoon's proceeds to the hospital. The first picture to be shown will be the "Gold Diggers of Broadway," an all-talking, singing and dancing picture in entirely natural colours. A New Note in Design and Construction. The Lytham Palace strikes a new note in theatre construction and design. It is essentially modern, and as regards design one may venture to suggest that it is the most original in the country and a model of its kind worthy of emulation anywhere in England. The designers, Messrs. Frank Matcham and Co. (of which Mr. F. G. 31. Chancellor, F.R.I.B.A., is the architect), are the firm who co-operated with Mr. Thomas Lamb, of New York, in the construction of the Empire, which has been justly described as one of the finest cinemas in the world. Mr. Chancellor is, moreover, the architect, who has been appointed to build North London's home of Shakespeare, the Sadler's Wells Theatre. The skill and imagination shown by the architects of these two famous theatres is evident in the design of Lytham's new theatre. The outside is typically modern, and is an example of a style which is a comparatively recent, and very worthy contribution to architecture. The front of the cinema is very colourful, the main structure being cream-coloured faience with a buff frieze, plum coloured parapet and surmounted by an effective panelled frieze in cream on a blue ground, depicting particularly striking ground, depicting sculptured figures. It has a Wedgwood effect which is particularly striking.